I’ve heard it said that sabremetrics biggest contribution is to validate common sense. There is some truth to that. For instance, last night, with runners on 1st and 2nd and nobody out, Michael Cuddyer was thrown out stealing third base. There is no question that is a boneheaded play. Cuddyer can already score without the team getting a base hit, just by advancing on balls in play. And getting to third base doesn’t increase his chances of scoring that much considering there are no outs. That’s common sense. When it happened, rather than launch into a “What is in that young man’s head?” rant, announcer Bert Blyleven said something to the affect of “If you’re going to try to steal that base in that situation, you had better make it.” He’s right, and if you want to confirm how dunderheaded that steal was, that’s exactly how you do it – by measuring just how often it needs to pay off to make it worthwhile. So, when an inning begins without any runners on base and 0 outs, the matrix says an average of .544 runs were scored. But if the leadoff batter gets on first, an average of .941 runs are scored. By getting on base, the leadoff batter did his part to add 4/10 of a run to his team. 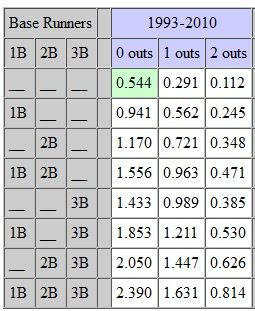 Using a table like this, you can validate that Cuddyer had to be very sure to steal that base. Stealing it would have increased the teams run expectancy from 1.556 to 1.853, or about 3/10 of a run. But getting caught cut the run expectancy from 1.556 to .562, almost a full run. With those numbers, if he doesn’t make it 77% of the time, it’s a bad play. That’s a high percentage when it comes to stealing bases. It made me wonder what the stats would say about some baserunning earlier in the game. The inning before, Ben Revere had got on base and stole second with one out. Batting behind him were Rene Rivera and Matt Tolbert. But that is definitely not common sense. I’ve been told by people I respect that I’m an idiot for even suggesting Revere attempt that steal. Why lose a guy in scoring position, just to get him a little further into scoring position? So let’s evaluate that statistically using the same matrix. First, I’ll point out that stealing second base increased the run expectancy by .16 runs. But if he steals third base, he increases the run expectancy by .26. So it is definitely valuable for him to steal that base, more so than stealing second. But it’s also true that getting caught is a lot worse. If you crunch the numbers, one needs to be slightly more certain of stealing third base – 69% versus 67% for stealing second base. And, of course, it is usually harder to steal third base. Still, I would argue that the historically inept batters behind Revere balance some of that out. For the record, Revere didn’t score. So in this case, statistics lend a little nuance to the debate that common sense might not have. Stealing third with one out is quite valuable valuable, and even though one needs to be a little more confident, it’s not crazy. Cuddyer made a boneheaded play. The so-called "run expectancy matrix" is pretty much nonsense. All you have to do is consider the same situation with a pitcher who looked unhittable and the game tied and Tolbert and Butera coming to the plate and ... there is a very long list of considerations that has nothing to do with the average situation based on number of outs and the position of the base runners. In fact, what made it a bonehead play was that the pitcher was struggling and having a hard time finding the plate. You don't want to give him any easy out in that situation. If it were an average pitcher, the chances one of the next three hitters would get a hit is less than 50-50 given the struggles of Twins hitters. I suspect those struggles were part of Cuddyer's thinking. As for stealing third. There are a lot of factors that go into the runners chances, including whether the pitcher and batter are left of right handed, the catcher and how closely the middle infielders are holding the runner. Which brings us to the obvious, it was ALWAYS a good idea to steal if you are successful and it was ALWAYS a bad idea if you aren't. If Cuddyer had not got caught, it would have been a good play no matter what the situation. The table (run expectancy matrix) assumes recent league average hitting, an incorrect assumption. With the current Twins so far below those levels, you would have to adjust the table to your actual hitters to make it accurate for the current low output Twins offense. Aggressive baserunning is more justified as the odds at bunching hits decreases. When Cuddyer took off the runner at first -- Valencia -- should have also taken off. The throw can't go to both bases. The successful double steal would have had the upside of increasing the typical run count to 2.050 -- an upswing of 0.5. The downside -- had Valencia run -- would have been a runner on second, which at .721 runs is a better situation than the .562 expected runs of Valencia staying put. That still leads to a reduction of about 8/10 of a run. The math still points to bone-headed base running on Cuddyer's part, but the numbers wouldn't have been as bad had Valencia been on the same page. You don't try to steal if you think you will be thrown out and I think if Valencia runs based solely on Cuddyer going first, he gets thrown out easily at second. In other words, his only hope of getting to second safely is that the Royals try to make the play at third. You are essentially giving the Royals a sure out in hopes they will give it back. Of course having Valencia thrown out at second is better than Cuddyer getting thrown out at third. But you don't run the play at all if you think either is the outcome. What I think Cuddyer's attempt shows is the same thing we saw with Casilla's attempted bunt with three strikes the other night. The Twins are pressing to find ways to win. They are taking gambles they wouldn't if things were going better. If you expect the next three hitters to hit, you don't need to move yourself to third. With both runners going you might in fact increase the chance that they both make it. If the catcher hesitates just a bit in trying to decide where to throw that may be enough to allow the runners to get in safely. Not just always, but ALWAYS, eh? Suppose there are two outs in the bottom of the ninth. The score is 2-1. I'm Prince Fielder. I hit a double. Shouldn't matter who's up next, but since you're throwing ALWAYS at me, let's suppose it's Ryan Braun. Suppose the count goes to 3-0. Suppose the 3rd base coach gives Braun the take sign. First baseman Joey Votto jogs up to the pitcher, Aroldis Chapman, who's been hitting 104 on the gun, and I overhear Votto telling Chapman that he, Votto, figured out the Brewers sign system and that Braun will be taking here. "Give 'em a fastball right down the middle," Votto tells him. So Votto runs back to his position. I know an 104 mph fastball is coming, that Braun is going to take, that he'll be facing a hitter's 3-1 count next pitch, that my run "doesn't matter" (please, no pedantic explanation why all runs count equally), and that, once again, I'm Prince Fielder. Pitcher winds, delivers, I take off for third, Chapman throws a strike, breaks the catcher's mitt hand, the ball rolls out in front of the mound, Chapman runs over, picks the ball up, and still nearly throws me out at third. Because, again, I'm Prince Fielder. So you want to tell me that I because I stole successfully that attempt was a good idea? Really? Sometimes when I see a really bad movie I wonder if the person who made it recognizes how awful it is, or whether their pride of ownership makes them blind to the self-evident faults. I have a similar reaction to most of your contrarian comments TT: Do you hear the bleating nonsense in your comments, or are you so infatuated with your own contrarian ethic that you actually mistake that nonsense for insightful commentary? Sorry for playing the troll here, but one does grow tired of silly old billygoats. Score should be 3-1 for the run not to matter. Whoops. "So you want to tell me that I because I stole successfully that attempt was a good idea? Really?" I guess I should have prefaced that with "in the real world". In an alternative universe, maybe its not true. Its a little like saying "what if the temperature goes to a 150 in the shade in Fairbanks in the winter. "that my run "doesn't matter"
Apparently it is an alternative universe where Fielder's run "doesn't matter" in a 2-1 baseball game. That sounds like "bleating nonsense" to me. In any case, my only point in those ALWAYS was that success is the only real defense of attempting a steal. If you are successful, it was a good idea since you correctly calculated that you would be successful. And if you get caught, you miscalculated, whether there was high value in stealing or not. I find myself agreeing with TT on something! The 'run matrix' is often used here and elsewhere to argue strategy. But the run matrix has little relationship to actual baseball. The 'average' anything has little relationship to the 'actual' everything. In the case of the run matrix, there is pretty much never an 'average' hitter facing an 'average' pitcher, with 'average' baserunners on base, with 'average' fielders on defense. Every situation is unique, and using a decade's worth of averages doesn't tell you a whole lot about that unique situation, and surely doesn't tell you how many runs you can expect to score. If you believe in the run matrix, you also believe that Albert Pujols at the plate, facing Jim Hoey, is the same as Drew Butera at the plate, facing Mariano Rivera. Or that Jim Thome on 1st base with two outs has the exact same chance to score as Ben Revere. One thing about the play not mentioned is that Cuddyer tried to steal on a breaking ball. Assuming he stole the sign and knew a breaking ball was coming, that certainly makes it a higher percentage play that didn't work out, especially with a right-handed hitter batting. Plus, with a runner on first as well, its doubtful that Cuddyer is able to score without a hit, since the double play is still a possiblity. I didn't mind the play too much because if you're going to make a mistake, at least make it an aggressive one. Plus, it wasn't like it was an easy play. It was a great throw and he still almost was safe. Cardinal rule: Never make the first or third out at third base...or you could just go with the run expectancy matrix? The Run Expectancy Matrix isn't perfect, but it does give you actual data to work with rather than just a series of hypothetical arguments. And I'd argue that the REM is still useful even if your batters are above or below 'league average' -- if your next hitters are STEVE HOLM and Tolbert, sure, your 'successful steal' run expectency will actually be lower than shown in tne matrix, but the run expectancy for not stealing will also be lower. The change in run expectancy ahould still be proportionate (unless you want to argue that Tolbert is less below average with a runner on second than he is with a runner on third). And it's the change in run expentancy, not the raw number, that we're interested in here. "The change in run expectancy ahould still be proportionate "
I don't think there is really any evidence for this. The runner will score on a home run, regardless of what base they are on. This means the value of advancing is much greater when Tolbert is coming to the plate than when it is Thome. And that kind of change in value isn't limited to home runs. Hitters are just one of many factors that substantially change the value of advancing. "it does give you actual data to work with rather than just a series of hypothetical arguments." It isn't "actual data", its a conclusion drawn from the data. And the data, by itself, doesn't support it. As far as I know, no one has ever even shown that the run matrix, or win matrix, is consistent from team to team, much less consistent across all the other variables that come into play in actually determining the outcome you would "expect". "The change in run expectancy ahould still be proportionate (unless you want to argue that Tolbert is less below average with a runner on second than he is with a runner on third)." So a team would expect half as many runs with Tolbert at the plate each time. But the actual value of the change from first to second and second to third is also half the average. This is if the change is proportionate. A team can expect a half run less with Tolbert at the plate regardless of the position of the base runner. Thanks for the troll. I'll spare you the effort of doing it again by refraining from commenting here.